Increasing consumer demand for natural products has renewed food industry attention in biopreservation. Lactic Acid Bacteria (LAB) are of particular interest as effective alternatives to chemical preservatives because of their food grade status (Gerez et al., 2010a, b; Coda et al., 2011). Some LAB have the ability to produce inhibitory growth compounds, in a final fermentation products (Cardoso et al., 2012), these compounds are known: formic, propionic, butyric, valeric and caproic acids (Corsetti et al., 1998); phenyllactic acid, cyclo (Phe-Pro), cyclo (Phe-OH-Pro), and reuterin (Maganusson and Schnürer, 2001); 4-hydroxyphenyllactic acid (Lavermicocca et al., 2000); acetic acid and lactic acid (Gerez et al. 2009; OCallahan et al., 2012) and have the ability to retard or eliminate mycelia growth or spore germination, either on their own or synergistically (Guo et al., 2012). Some genera and species appear to be more active than others. The genus Lactobacillus is found in most research study on antifungal activity of LAB (Magnusson et al., 2003; Voulgari et al., 2010), then, the genera Lactococcus (Florianowicz, 2001), Pediococcus (Rouse et al., 2008; Dalie et al., 2010), Enterococcus (Voulgari et al., 2010), Leuconostoc (Choi et al., 2012) and Weissella (Ndagano et al., 2011; Baek et al., 2012). Most of these studies were evaluated the production of antifungal compounds without changing bacterial growth factors and a few works were studied the influence of abiotic and biotic factors on the production of antifungal compounds. The aim of this study is to find the factor that increases the production of antifungal compounds by Lactobacillus. Cultures and isolates: Six lactic acid bacteria studied; Lactobacillus plantarum LB54, LB51, LB52, LB20, LB24 and Lactobacillus farciminis LB53 were isolated from silage, carrot and camel milk; were maintained on MRS (de Man Rogosa Sharpe) agar and stored at 4°C. The fungi Aspergillus sp. was obtained from the Laboratory of mycology and parasitology of Sidi Belabbes (Algeria). Effect of abiotic and biotic factors on the antifungal activity: The effect of abiotic and biotic factors on the antifungal activity was evaluated by overlay assay described by Magnusson et al. (2003). Antifungal activity under different temperatures: Bacteria were streaked in two lines on MRS agar plates and allowed to grow at 25, 30 and 37°C for 48 h. After chloroform treatment, 10 mL of soft malt extract (0,7% agar) containing 0.1 mL of inoculums of mould (103 sp. mL-1) was then poured onto the agar plates and incubated at 30°C. After 72 h, the percentage of inhibition was calculated as the area of inhibited growth in relation to the total area of the Petri dish. Antifungal activity in different pH: Bacteria were streaked in two lines on MRS agar plates with different pH values (2, 3, 4, 5, 6 and 7) and allowed to grow at 30°C, for 48 h. Then 10 mL of soft malt extract (0,7% agar) containing 0.1 mL of inoculums of mould (103 sp. mL-1) was then poured onto the agar plates and incubated at 30°C. After 72 h, the percentage of inhibition was calculated. Antifungal activity on modified MRS: The composition of MRS agar was modified, MRS without: meat extract, meat extract and glucose, meat extract and peptone, meat extract and yeast extract, sodium acetate, meat extract and glucose (the glucose was replaced with sucrose, fructose, galactose, mannitol, sorbitol, arabinose, xylose, rhamnose, trehalose, sorbitol and lactose) were used to evaluate the effect of these compounds on the production of antifungal compounds. Bacteria were streaked in two lines on modified MRS agar plates and allowed to grow at 30°C, for 48 h. Then 10 mL of soft malt extract (0,7% agar) containing 0.1 mL of inoculums of mould (103 sp mL-1) was then poured onto the agar plates and incubated at 30°C. After 72 h, the percentage of inhibition was calculated. Antifungal activity under different temperatures: Similar percentage of inhibition (53.19%) has been observed at temperatures tested 25°C and 37°C by Lactobacillus plantarum LB24. 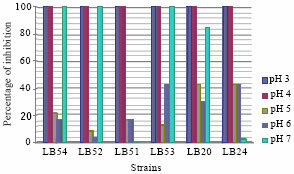 Lactobacillus plantarum LB54 and LB52 showed a maximum production of antifungal compounds when grown at 37°C (Table 1, Fig. 1, 2), this result is similar to those obtained by Falguni et al. (2010) when incubated L. brevis NCDC at 37°C. The large zone of inhibition was observed by Lactobacillus farciminis LB53, Lactobacillus plantarum LB51 and Lactobacillus plantarum LB20 at 25°C, the percentage of inhibition by these strains was 38.29, 72.34 and 79.78%, respectively (Table 1, Fig. 1). Zhao (2011) observed that the maximum antifungal activity for strains Lactobacillus plantarum NB, Lactobacillus plantarum DC2 and Lactobacillus plantarum SDR at growth temperatures of 25, 37 and 45°C. No conidia forming was observed from the survival mycelia inhibited by all Lactobacilli at 30°C compared to other temperatures (Fig. 1-3), therefore, it is the best temperature for the production of antifungal compounds. Similar temperatures (30°C) were suggested by Rouse et al. (2008) and Bianchini (2011) as ideal for the production of antifungal compounds by L. plantarum in MRS broth. Roy et al. (1996) studying the production of antifungal compounds by Lactococcus lactis subsp. Lactis reported optimum incubation temperature at 30°C. Maganusson and Schnürer (2001) suggested also that the incubation at 30°C as ideal for maximum production of antifungal compounds by Lactobacillus coryniformis subsp. Coryniforms in MRS broth. Antifungal activity in different pH: All isolates when grown at pH 3 and 4 show a stronger antifungal activity, and decreased at pH 5 and 6. The best percentage of inhibition at pH 5 and 6 was 42.55%; was done by Lactobacillus plantarum LB20 and LB24; Lactobacillus farcimins LB53 and Lactobacillus plantarum LB24, respectively (Fig. 5). Rouse et al. (2008) reported that their strain of L. plantarum, produces the antifungal compounds in the lower pH range. However, Maganusson and Schnürer (2001) reported that their strain of Lactobacillus coryniformis subsp. Coryniformis, produces the antifungal compounds in the highest pH. The isolate Lactobacillus plantarum LB51 lost their antifungal activity at pH 7, although the antifungal activity of Lactobacillus plantarum LB54, Lactobacillus plantarum LB52 and Lactobacillus farciminis LB53 remained at pH 7. Lactobacillus plantarum isolated by Bianchini (2011) showed more inhibition of mold growth towards the higher pH levels tested, with pH 5-7. Falguni et al. (2010) suggested that the maximum production of antifungal compounds by L. brevis NCDC at pH 6 and 7 in MRS broth. Dalie (2010) observed also good inhibition of Fusarium by pediococcus pentosaceus L006 at pH 5 and 7. Antifungal activity on modified MRS: All isolates have the ability to grow on MRS agar, when the glucose was replaced with sucrose, fructose, galactose, mannitol, sorbitol, arabinose, xylose, rhamnose, trehalose, sorbitol, lactose and without meat extract. The best inhibition was done when the glucose was replaced with sorbitol, mannitol and trehalose (Fig. 4). Klewicka (2007) reported that the polyols like glycerol, lactitol, erythritol, sorbitol, mannitol induce antifungal activity by Lactobacillus spp. towards different species of fungi, and the best inhibition was done by sorbitol. No inhibition was observed by all isolates when the glucose was replaced with xylose because most of these bacteria do not ferment this carbohydrate. Rouse et al. (2008) studied the inhibitory effect of four LAB when grown in the presence of different carbon sources including glucose, sucrose, lactose, fructose and sorbitol. Among their LAB, one was L. plantarum, which showed best results against Penicillium notatum when grown in a medium equivalent to MRS prepared with glucose. The presence a zone of inhibition by all isolates on MRS without: meat extract, meat extract and peptone, meat extract and yeast extract (Table 2). Batish et al. (1990) observed also the presence of antifungal compounds in the absence of yeast extract (7.50 unit mL-1); beef extract (21.50 unit mL-1) and tryptone (5.00 unit mL-1). No inhibition was observed on MRS without meat extract and glucose, although, the amount of activity produced does vary depending on the carbon source. Aspergillus sp. 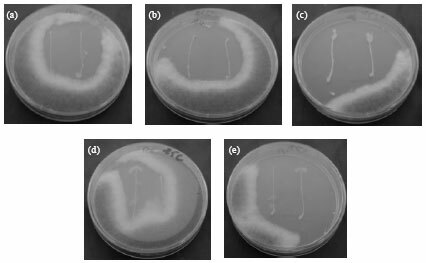 has the ability to grow on MRS agar with sodium acetate suggesting that sodium acetate did not affect the growth of Aspergillus sp. 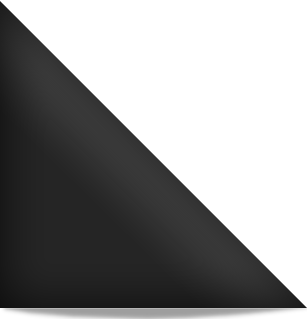 at the concentration used in MRS medium, this result is similar to those obtained by Stiles et al. (2002). The same zone of inhibition was observed in the presence and absence of sodium acetate. Aspergillus repens NRRL 13, Aspergillus versicolor M 1069 and Aspergillus candidus C 25, were completely inhibited by L. rhamnosus VT1 on MRS agar plates without sodium acetate (Stiles et al., 2002). Schillinger and Villarreal (2010) observed that LAB strains producing large zones of inhibition on MRS agar plates were unable to produce inhibition zones on MRS without sodium acetate. When the mould A. fumigatus was evaluated against P. jensenii, it was more strongly inhibited when the Propionibacteria were cultured on MRS with sodium acetate (Lind et al., 2005). This study shows that the temperature, pH and nutrients of the culture medium could influence the production of antifungal compounds by lactic acid bacteria. These factors (abiotic and biotic) change the metabolism of LAB; therefore change the effect of antifungal compounds on germination of conidia and growth of mycelia. Baek, E., H. Kim, H. Choi, S. Yoon and J. Kim, 2012. Antifungal activity of Leuconostoc citreum and Weissella confuse in rice cakes. J. Microbiol., 50: 842-848. Batish, V.K., L. Ram and S. Grover, 1990. Studies on environmental and nutritional factors on production of antifungal substance by nutritional factors on production of antifungal substance by Lactobacillus acidophilus R. Food Microbiol., 7: 199-206. Bianchini, A., 2011. Antifungal activity of lactic acid bacteria: Factors affecting production and stability of Antifungal compounds of Lactobacillus plantarum and effects of the antifungal compounds on growth and Aflatoxin production by Aspergillus spp. Ph.D. Thesis, Nebraska University. Cardoso, M.D.L.M., R.M. Manzo, G.G. Tonarelli and A.C. Simonetta, 2012. Characterisation of a cell-free supernatant obtained from cultures of Enterococcus faecalis DBFIQ E24 with antagonistic activity against bacteria, yeasts and moulds. Int. J. Dairy Technol., 65: 568-577. Choi, H., Y.W. Kim, I. Hwang, J. Kim and S. Yoon, 2012. Evaluation of Leuconostoc citreum HO12 and Weissella koreensis HO20 isolated from kimchi as a starter culture for whole wheat sourdough. Food Chem., 134: 2208-2216. Coda, R., A. Cassone., C.G. Rizzello., L. Nionelli., G. Cardinali and M. Gobbetti, 2011. Antifungal activity of Wickerhamomyces anomalus and Lactobacillus plantarum during sourdough fermentation: Identification of novel compounds and long-term effect during storage of wheat bread. Applied Environ. Microbiol., 77: 3484-3492. Corsetti, A., M. Gobbetti, J. Rossi and P. Damiani, 1998. Antimould activity of sourdough lactic acid bacteria; Identification of a mixture of organic acids produced by Lactobacillus sanfrancisco CBI. Applied Microbiol. Biotechnol., 50: 253-256. Dalie, D., 2010. Biocontrole des moisissures du genre Fusarium productrices de fumonisines par selection de bacteries lactiques autochtones de mais [Biocontrol fungi of the genus Fusarium-producing fumonisins by selection of lactic acid bacteria from corn]. Ph.D. Thesis, Bordeaux University, France. Dalie, D.K.D., A.M. Deschamps, V. Atanasova-Penichon and F. Richard-Forget, 2010. Potential of Pediococcus pentosaceus (L006) isolated from maize leaf to suppress fumonisin-producing fungal growth. J. Food Prot., 73: 1129-1137. Falguni, P., V. Shilpa and B. Mann, 2010. Production of proteinaceous antifungal substances from Lactobacillus brevis NCDC 02. Int. J. Dairy Technol., 63: 70-76. Florianowicz, T., 2001. Antifungal activity of some microorganisms against Penicillium expansum. Eur. Food Res. Technol., 212: 282-286. Gerez, C.L., M.I. Torino, G. Rollan and G.F. de Valdez, 2009. Prevention of bread mould spoilage by using lactic acid bacteria with antifungal properties. Food Control, 20: 144-148. Gerez, C.L., M.I. Torino, M.D. Obregozo and G.F. de Valdez, 2010. A ready-to-use antifungal starter culture improves the shelf life of packaged bread. J. Food Prot., 73: 758-762. Gerez, C.L., M.S. Carbajo, G. Rollan, G. Torres Leal and G.F. de Valdez, 2010. Inhibition of citrus fungal pathogens by using Lactic acid bacteria. J. Food Sci., 75: 354-359. Guo, J., B. Brosnan, A. Furey, E.K. Arendt, P. Murphy and A. Coffey, 2012. Antifungal activity of Lactobacillus against Microsporum canis, Microsporum gypseum and Epidermophyton floccosum. Bioeng. Bugs., 3: 104-113. Klewicka, E., 2007. Antifungal activity of lactic acid bacteria of genus Lactobacillus sp. in the presence of polyols. Acta Alimentaria, 36: 495-499. Lavermicocca, P., F. Valerio, A. Evidente, S. Lazzaroni, A. Corsetti and M. Gobetti, 2000. Purification and characterization of novel antifungal compounds from the sourdough Lactobacillus plantarum strain 21B. Applied Environ. Microbiol., 66: 4084-4090. Lind, H., H. Jonsson and J. Schnurer, 2005. Antifungal effect of dairy propionibacteria contribution of organic acids. Int. J. Food Microbiol., 98: 157-165. Maganusson, J. and J. Schnurer, 2001. Lactobacillus coryniformis subsp. coryniformis strain Si3 produces a broad-spectrum proteinaceous antifungal compound. Applied Environ. Microbiol., 67: 1-5. Magnusson, J., K. Strom, S. Roos, J. Sjogren and J. Schnurer, 2003. Broad and complex antifungal activity among environmental isolates of lactic acid bacteria. FEMS Microbiol. Lett., 219: 129-135. Ndagano, D., T. Lamoureux, C. Dortu, S. Vandermoten and P. Thonart, 2011. Antifungal activity of 2 lactic acid bacteria of the Weissella genus isolated from food. J. Food Sci., 76: M305-M311. O'Callahan, D.R., T. Singh and I.R. McDonald, 2012. Evaluation of lactic acid bacterium from chilli waste as a potential antifungal agent for wood products. J. Applied Microbiol., 112: 436-442. Rouse, S., D. Harnett, A. Vaughan and D. van Sinderen, 2008. Lactic acid bacteria with potential to eliminate fungal spoilage in foods. J. Applied Microbiol., 104: 915-923. Roy, U., V.K. Batish, S. Grover and S. Neelakantan, 1996. Production of antifungal substance by L. lactis sub sp. lactis CHD-28.3. Int. J. Food Microbiol., 32: 27-34. Schillinger, U. and J.V. Villarreal, 2010. Inhibition of Penicillium nordicum in MRS medium by lactic acid bacteria isolated from foods. Food Control, 21: 107-111. Stiles, J., S. Penkar, M. Plockova, J. Chumchalova and L.B. Bullerman, 2002. Antifungal activity of sodium acetate and Lactobacillus rhamnosus. J. Food Prot., 65: 1188-1191. Voulgari, K., M. Hatzikamari, A. Delepoglou, P. Georgakopoulos, E. Litopoulou-Tzanetaki and N. Tzanetakis, 2010. Antifungal activity of non-starter lactic acid bacteria isolates from dairy products. Food Control, 21: 136-142. Zhao, D., 2011. Isolation of antifungal lactic acid bacteria from food sources and their use to inhibit mold growth in cheese. Masters Thesis, San Luis Obispo University, California, USA.